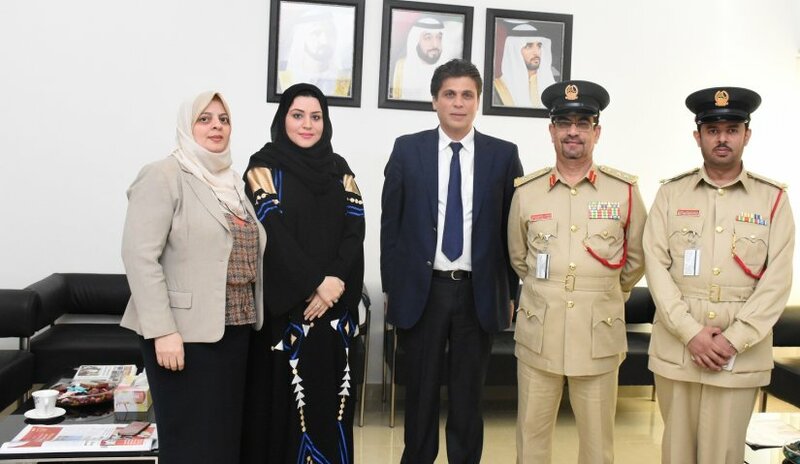 Vice President Al Falah University Dr. Samir Barghouthi and Director of Student Affairs Ms. Ghada Waleed received a delegation from the General Headquarters of Dubai Police. The delegation included Col. Jasim Khalil Mirza , Director of Security Awareness Management and Ms. Sarah Salih Jassim Head of Programs and Activities. The distinguished representatives discussed security awareness management in order to share innovative ideas of awareness activities launched by the Dubai Police. The discussion focused on many creative ideas about security awareness targeting young people, in order to clarify the seriousness of the wrong use of social networking sites, which has proved to have dangerous impacts on the community. At the end of the meeting, the two sides stressed the need for permanent cooperation between them for the exchange of ideas that will help spread security awareness in the United Arab Emirates.